In the field of genealogy, we always have to be ready to adjust our preconceived notions. Who would think to check the Indian reservation census records for their white ancestry? In her most recent article, "Genealogy of Communities: Indian Reservations," Judy Rosella Edwards illustrates the fact that Indian reservations were not exclusively Native American. "Understanding terminology is essential for researching educational communities. 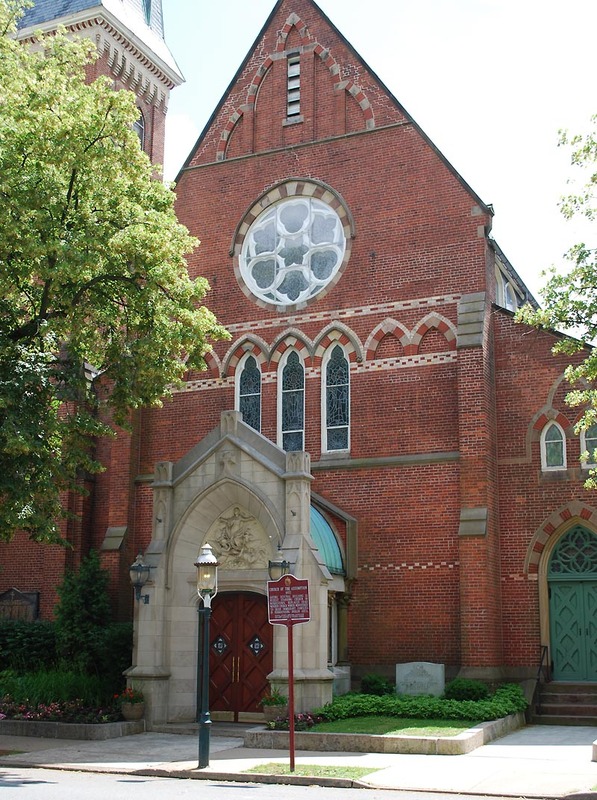 In the late 1800s, seminaries appeared across the country. For years there have been academies, colleges, and universities. Students and others associated with these institutions, were counted in various ways and there are techniques for researching them," so writes Judy Rosella Edwards in her most recent article, "Genealogy of Communities: Seminaries and Other Educational Institutions." Again, using the census in concert with institutional histories and college yearbooks may help in locating or learning more about an ancestor. The challenge, perhaps, is identifying what schools existed at what periods of time in a particular location, for which we turn to local area histories. As the article points out, "Knowing a college town makes research that much easier," and local maps can often help in identifying neighborhoods and homeowners. In a recent press release, the Manchester and Lancashire Family History Society (MLFHS), based in the U.K. announced the release of its genealogy toolbar which integrates seamlessly with the users browser (IE, Firefox, Safari) to provide instant access to family history sites including online BMD, Archives, Societies, Pay to View and many more. 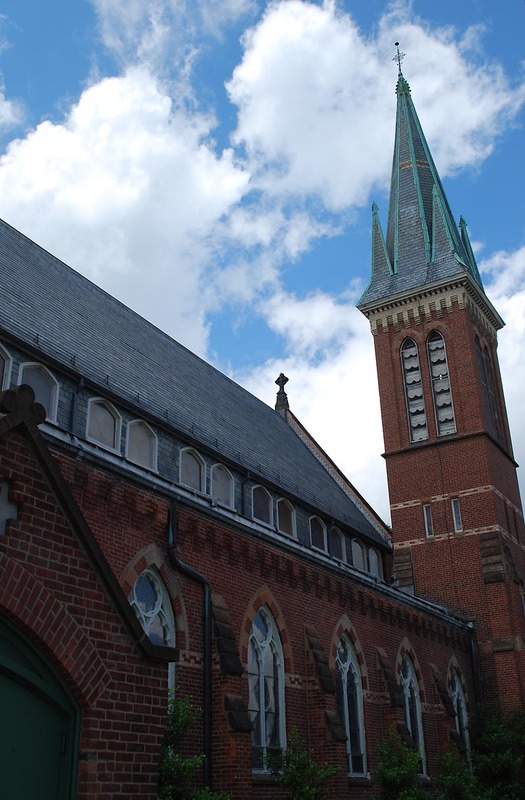 The toolbar is completely free to download and use and has been developed by Family Historians for use by Family Historians. As noted in the press release, "the range of links is especially strong for GB [Great Britian] and Irish research." It does, however, provide links to a number of primary U.S. sites. Changes to the toolbar are made centrally, which means the toolbar developers control what is available, but the site currently offers over 170 links, which will be "expanded in response to user comments and suggestions." Users do have the ability to turn individual menus on and off and can also choose to add items from a selection of non-genealogy links. The toolbar can be downloaded via the MLFHS home page www.mlfhs.org.uk or from http://MLFHS.OurToolbar.com/. Be sure to read the User Notes, available in a drop-down list, indicated by an arrow at the far left of the toolbar, next to the Society's icon. Today catalogs were added from the following groups: Picton Press, Broadfoot Publishing, Arphax Publishing, GoldBug Maps, [Loyalist, Paul] Bunnell Genealogy Books, Gorin Genealogical Publishing and IllinoisHistory.com. In addition, this week I've fixed close to 500 broken links (mainly sites that have left rootsweb.com, aol.com, compuserve.com and/or geocities.com). Modern technology has brought convenient access to millions of documents, with more being made available every minute, it seems . . . but not everything. Many archives and libraries house unique and valuable information that is not available online . . . and may never be. Because so many of these materials are irreplaceable, access to that material is governed by specific rules. In her article, Research Room Etiquette: What to Bring and What to Do in Archive or Library Research Rooms, Rita Marshall provides some important guidelines to help your prepare. "You may have heard about Verizon's sale of its internet services in Maine, New Hampshire, and Vermont a few months ago. Some readers may even be the victims of the sudden switch of their e-mail addresses from verizon.net to myfairpoint.net. Neither Verizon nor FairPoint notified all customers in time to tell their family, friends, and business contacts of their new e-mail addresses. Many people not only lost all e-mail they had stored on Verizon's servers, but they also lost new messages that were sent to their void Verizon addresses. Furthermore, when FairPoint took over those accounts, their servers were initially overburdened, causing still more lost e-mail messages." It's true. Companies go out of business. Companies are sold. Systems crash. What happens to your data is everything goes away suddenly? We hope you are 1) saving your e-mail messages (including contact information) and any documents or photos you may have received to your local computer; and 2) transferring whatever data and sources your have received to your genealogy software program . . . or are at least printing it all out. Then, if a company goes belly-up, you've at least preserved your data. But, as the article points out, there are other, equally important issues, that come with a change in your e-mail provider -- be sure to check it out. FamilySearch volunteers expect to have transcribed more than 325 million names by the end of 2009, just three years after the organization began its online indexing program," according to an article in today's Deseret News, "Technology helps FamilySearch hit major milestone." The milestone was a number once thought impossible to reach in such a short period of time. In 2006, a few thousand volunteers indexed only 11 million names. But thanks to continuing advances in technology and a growing number of volunteers -- more than 100,000 across five continents -- an estimated half million individual names are indexed each day. At that rate, Paul Nauta, FamilySearch public affairs manager, expects that 500 million names will be transcribed by the end of 2010. "With the technological advances and the ever-increasing number of indexing volunteers, the Ellis Island historical records -- which a decade ago took 12,000 volunteers 12 years to complete -- would take three weeks to index today. " "The records FamilySearch contains currently, when digitized, would equal 132 Libraries of Congress or 18 petabytes of data -- and that doesn't include our ongoing acquisition efforts." As we all know, holidays and special days are often promoted for commercial purposes, but I guess if it helps us remember something we might otherwise overlook or take for granted, that's a good thing. One such special day, Grandparent's Day, is coming up on September 13. And while this day has not caught on in the same way as Mother's Day or Father's Day, it could be a good day for gathering grandparent stories (pass the word). An article this week on Examiner.com, "Tweens: 5 Ways to Celebrate Grandparent's Day," cites the following statistics: "4 million children in 3 million homes are being raised by their grandparents. More than 5 million children live in a household with a grandparent present." But interviewing a grandparent is a good idea, whether they live in the home or not. The article itself is a little commercial, but it does offer some good ideas for children to connect with grandparents, and provides a link to downloadable book -- a template children can use to gather a grandparent's life story. In addition to interviewing a grandparent and writing their life story, sitting together with grandparents and going through old photographs can be a unforgettable experience: photos are excellent memory triggers, and if you write down the stories as you go, or even better yet, record the activity and then write it down, you will ensure it's being "unforgettable" (and don't forget to back it up!). This month, in her article, "Lexicons of Lost Lifestyles: In Passing, Part 1," Jean Hibben examines the origin of phrases alluding to things seemingly dead or non-functioning. As the article points out, most people refer to the death of a person in euphemistic terms, but have no trouble using the word directly to describe inanimate things or a variety of conditions: dead wrong, deadhead, and dead herring, to name a few. A recent article on Examiner.com, "Genealogy 101: I Have the Results of My Genetic Genealogy Test, Now What," highlights an e-book (published in 2008) by Blaine T. Bettinger, Ph..D., author of The Genetic Genealogist, with a link to a FREE download. The book is useful, not only as a practical guide to Y-DNA and mtDNA testing, but also provides information to help you find what DNA studies have been performed, and how and where to find various DNA and Surname groups. Roots Television has released a video interview about Live Roots, featuring Illya D'Addezio, President and Founder of Genealogy Today. In this video, Matthew Poe talks with Illya about the site's new offerings. The interview was conducted at the Southern California Genealogical Jamboree in Burbank, California. In this second article of her series, "Genealogy of Communities: Logging Camps," Judy Rosella Edwards makes the point that lumberjacks were not the only occupations present in logging camps, but doctors, cooks, and others were also engaged. And pretty much, you wanted to be young and unattached. With the 70th anniversary of the start of World War Two (September 1, 2009) approaching, Ancestry.ca has launched online British Army Prisoners of War, 1939-1945, which contains the records for more than 100,000 prisoners of war (POW) captured during the conflict, including the names of many ancestors of living Canadians. Nearly one-third of Canada’s population claims British heritage, which means that many Canadians with ancestors who fought for or alongside the British Army may be able to find ancestors in this collection. As one of the few World War Two archives not subject to the UK’s ‘75-year rule’, this collection is a vital resource for anyone looking to trace British and Commonwealth soldiers captured by German Forces during the war. The majority of World War Two records are not yet available to the general public as individual records are still protected by the rule. In addition to the POW records, Ancestry.ca has also published online the UK Army Roll of Honour, 1939-1945, featuring the records of all British Army personnel killed in action during World War Two. Most of us are aware that a variety of non-traditional communities exist in our society, and have existed in the past, places where are drawn together for one reason or another, possibly employment, but the people are generally unrelated. Take the California Gold Rush, for example. Researching family members who might have been part of such a community is the subject of a new series by Judy Rosella Edwards. In her first article, "The Genealogy of Communities," Edwards introduces these "intentional" communities, so-called because they are artificially created outside the traditional family community, and suggests the first steps to researching them. Additional articles in the series will cover specific types of communities, including logging camps, fishing camps, seminaries and prep schools, etc. Even if your community of interest is not covered, and it would be hard to detail them all, the techniques and resources explored will certainly transfer over. If you have ever experienced a system crash, you know how devastating it can be -- the challenge of trying to reconstruct information that has been damaged or irretrievably lost is the computer user's nightmare. As beneficial as computer technology is, and it's revolutionized the field of genealogy, it still comes with a powerful caveat: be aware of "data rot"; that is, the deterioration of the medium on which information is stored (CDs, DVDs, hard drives, magnetic tape, etc.) and the problem of accessing data when medium and the equipment to run it becomes obsolete. "The Ten Commandments on floppy? Where would we be?" explores the issues and what can be done to preserve valuable information. If you are in the area, mark your calendar for the Salt Lake Family History Expo, to be held August 28-29, 2009 at the South Towne Expo Center in Sandy, Utah. In addition to other presentations, FamilySearch will offer classes on New Family Search -- a class certain to be a hit. The New FamilySearch, currently available only to a select group is eagerly awaited by the genealogy community at large. For details, visit the Family History Expo website. If you have not yet submitted your DNA to the National Geographic, Genographic Project, a new film, "The Human Family Tree," airing August 30 might inspire to do so. For those who are not familiar, the Project is a a five-year research partnership led by National Geographic Explorer-in-Residence Dr. Spencer Wells, aimed at studying the migratory history of the human species through DNA contributed by hundreds of thousands of people from around the world -- everyday people like you and me. The film provides insight into how the Project works and what can be learned: "On a single day on a single street, with the DNA of just a couple of hundred random people, National Geographic Channel sets out to trace the ancestral footsteps of all humanity." To learn more, visit The Human Family Tree web site. The site offers a convenient Time Zone button to indicate when the film will air in your area. Reading a map is not easy. Ask all the frustrated drivers who have to stop and ask for directions, or turn to their digital navigation system! They still need to pass Map Reading 101. In her very informative article, "Map Reading 102," Judy Rosella Edwards lets us in on some lesser known map reading strategies. Some of you may remember the old insurance company slogan, "Buy a piece of the Rock," meaning the Rock of Gibraltar, the company's logo. Well, soon it may be possible to own a piece of the tree -- the family tree, that is. A recent article in the Salt Lake Tribune, "Ancestry.com plans to go public," reported this week that Ancestry.com is preparing for an initial public offering (IPO) of company stocks, joining the ranks of other publically owned companies on Wall Street. Formerly known as The Generations Network (earlier than that MyFamily.com and earlier than that, of all things, Ancestry.com), the company has now come full circle with its most recent name change, back to Ancestry.com: the brand, perhaps, having the mind share to carry the company into its public offering. If you have long "thought" about publishing your genealogy research but haven't seemed to quite get around to it, you might be interested in a recent article from the Examiner.com, "New England Genealogy 101: top 10 reasons to publish your research." Sometimes all we need is the right motivation. We often talk about the value of non-traditional sources and encourage readers to visit the Genealogy Today, Family Tree Connection database, absolutely THE place for researching non-traditional sources. In her article, "Historical Pageants As a Genealogical Tool," Judy Rosella Edwards provides a little background on historical pageants and their value, in particular, pageant programs, for historical data. Event programs are also known as "ephemera," printed items intended for one-time use. As it turns out, these one-time use items, in some cases, have become highly collectible, and can also be valuable clues for pinpointing an ancestor in time and place or indicating something of his or her life. Of course, in addition to the program, local newspapers carried news of local pageants, a more traditional source of information. Two for the money. While many of us do try to record the birth, marriage, and death dates of collateral line ancestors, we may not always go to the time and expense of documenting the information, especially for those ancestors who never married or never had children. We may think such family members have little to tell us . . . but, think again, suggests Cindy Drage in her article, "The Bachelor, the Spinster, and the Childless." It may be they knew more than anyone else -- those familiar with "Arsenic and Old Lace," might agree. Getting Past the Native Ancestry Block: Can DNA Testing Break Through the Wall? Proving native ancestry in North America is more than a little challenging, for a great many reasons. Today, DNA testing can help address some of the questions, but not as completely as one might hope. In her article, "Getting Past the Native Ancestry Block: Can DNA Testing Break Through the Wall?," Rita Marshall explores the various DNA tests, what they can and cannot tell us about our native ancestry, and how to proceed with what we learn. The entire newspaper collection from NewspaperARCHIVE.com has been cataloged into Live Roots, which added close to 4,000 new resources -- all with locations so they appear properly in the Navigate feature. In addition, I recently added "not" logic to the main Live Roots search. To negate a word in your query, place an exclamation point before the word (no space). For example, "johnson !county" would mean "show me all listings containing the word JOHNSON but NOT containing the word COUNTY." Keep in mind, the search is only as good as the listings in the catalog, so if a listing is about Johnson County, but doesn't include the word "county" in the listing, it will still appear. I posted the latest catalog update from the BYU Family History Archives project, about another 1,000 books. This is a wonderful project, similar to Google Books, but focused on resources of interest to genealogists. Also, posted yesterday, an update from FamilyOldPhotos.com, Teri Brown's growing collection of searchable group photos. In the continuing series on everyday words and phrases originating during war time, the American Civil War takes center stage, as Jean Hibben presents, "Lexicons of Lost Lifestyles: Words of War, Part 3. And who can reference the American Civil War without acknowledging Abraham Lincoln? Although Lincoln may have borrowed rather than coined the phrase, the concept (and potentially damaging consequences) of "swapping horses midstream" is accredited to him. This along with several other familiar words and phrases can be traced back to that same time period. Molecular genealogy, the study of DNA to help genealogical research, has made big strides over the last few years, but some answers are still out of science's reach. Learn what you can and can't learn from the different genetic tests, and which ones may be right for you. In this her first article, "Beyond the Paper Trail: Discovering Family History with Different DNA Tests," Rita Marshall queries experts in the field and brings us up to date on this exciting and promising new branch of genealogical research. 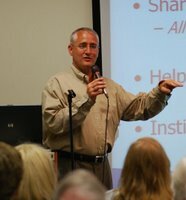 Last night I had the pleasure of listening to Dan Lynch speak at a local library about his book, Google Your Family Tree. I have to be honest, I've known about Dan's book since it was released, and had wondered in the past why he chose to write on this topic, and also why genealogists would want to buy such a book. But hearing Dan talk about the subject, and seeing the audience reactions, made me realize that I've really taken Google (and searching techniques) for granted. I especially love the subtitle of Dan's book, "Unlock the Hidden Power of Google." It's a great reminder of how much genealogy research, especially in the online world, is truly an "adventure." And just like Indiana Jones in the movies, genealogists need the skills necessary to filter through the enormous amount of information on the Internet and avoid those poisonous darts (i.e. overwhelming search results) that frustrate us. The talk last night was sponsored by the Family History Interest Group (FHIG) of Bernards Township Library, and the Morris Area Genealogy Society (MAGS), and was a packed room full of avid genealogists equally curious to learn some of Dan's "secrets" about the all-too-familiar Google search engine. The crowd was quiet for the first thirty minutes, or so, as Dan covered some of the basics to ensure everyone understood the essential components of Google. Then the "oohs" and "aahs" started, as Dan revealled some of his favorite tips for filtering results. Oh sure, I bet you were hoping that I'd spill the beans and share Dan's top tips. No such luck, there's no shortcut to becoming a better search engine user. Dan's talk was just the tip of the iceburg, and you really need to dig into his book (most folks I've talked to say every time they pick up their copy and re-read certain chapters, they learn something new). Bravo to Dan for taking on the challenge of making all genealogists better online sleuths. I now see how his efforts will benefit all information providers (small and large), by teaching genealogists to find what they are looking for more efficiently. Genealogists often speculate that the information they need to break down their brickwalls is "out there" somewhere. Why not spend $34.95 and purchase this book to gain the skills needed to actually find it! At a recent live auction that I attended there were three box lots of a monthly publication for the Brotherhood of Locomotive Firemen listed. I had been collecting a similar publication for the same group that later merged with another and became the Brotherhood of Locomotive Firemen and Enginemen, so my interest in these three lots was high. This may sound weird, but at these auctions I prefer NOT to look too closely at the items or lots. I look just enough to ensure that there is some genealogical value. That way I'm less disappointed if I don't win the lot. I "went for it" on these three, won them, and quickly shuffled them off to my truck. (Sadly, items do tend to mysteriously walk away at these auctions). The next morning I flew to Raleigh, N. C. for the NGS conference; it wasn't until this weekend that I finally had a chance to sit down and sort through the boxes. Just to put into perspective how exciting this find was, my previous collection of these publications focused between 1908 to 1916, although I did win a large lot off eBay covering 1928-1933. Recently, I managed to get a handful of copies from some dealers dating back to 1897. After sorting all 98 issues in these three boxes, I was amazed to see that they went all the way back to 1889! This is earlier than any issue I've ever seen for sale or online. Oh, why do I like these publications? They are filled with promotions, marriages, births of children and deaths of the members (i.e. railroad employees). Yesterday, I transcribed the ten issues from 1889 (March and November were missing), and just posted them online as part of my Family Tree Connection (subscription) database project. The name indexes are free to search, and you can browse through the issues by visiting http://LiveRoots.com or using the Live Roots for Facebook application. Each week, I will attempt to post another year of this amazing collection. What's that you say? A picture is not worth a thousand words? Another myth, busted! In her article, "When a Picture Is Not Worth a Thousand Words," Judy Rosella Edwards explores the ways in which pictures can deceive and why they considered secondary, rather than primary sources. The problem today is even worse. Technology has allowed us to warp reality in photos to such a degree that our children's children will never really know for sure what's real and what's not, without expert analysis to see if an image has been "photoshoped." So words of caution are well taken. When I started the Live Roots project, including living people was one of the first things that I considered. Behind every genealogical resource (e.g. website, book, podcast, etc.) is a person (or a group of people), and it's helpful to genealogists to know the "who's who" of our industry. The Live Roots project makes it easy to explore related resources from the same person, so you can see if they blog, write books, speak at events, all from their profile page. Genealogy researchers, writers and speakers are invited to signup for a free Live Roots profile at either the GenealogyToday.com or LiveRoots.com websites. 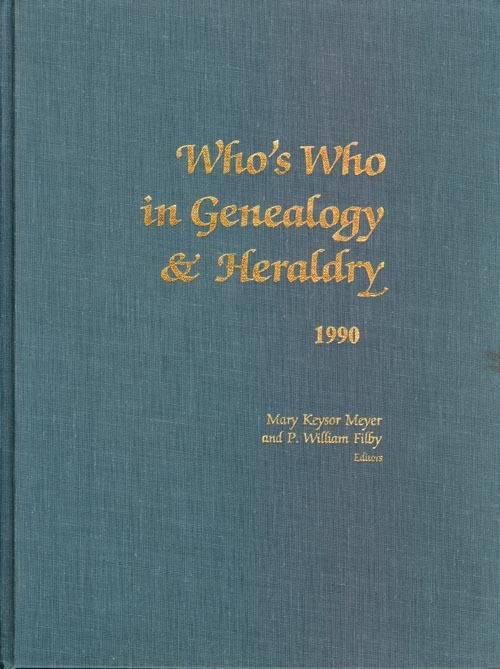 Did you know that back in 1981, Mary Keysor Meyer and P. William Filby edited a book called Who's Who in Genealogy & Heraldry (published by Gale Research Co)? I actually have a copy of the 1990 revised edition. Pretty neat book. Each listing has personal (with DOB), career activities and genealogical publications sections. Amazing how many industry professionals there were even back then; the second edition boasts 1,100 biographees. At a quick glance, I see that my friends Leland Meitzler, Arlene Eakle, Tom Kemp, Craig Scott and Kory Meyerink are all listed. This book is a reminder of just how important industry professionals, many of whom make genealogy their full-time occupation, are to genealogists around the world. It would be incredible to capture as many individuals in the Live Roots project.